This post was inspired by From Left to Write’s July book choice: The Execution of Noa P. Singleton, by Elizabeth L. Silver. I finally got through my first book club book since baby K was born in Nov. Which was a real feat considering he’s teething and I’m working 3 jobs. But, I am happy that I picked an easy first read. As I was reading, and nursing baby K, I read that paragraph above and it made me pause to start thinking about my life and the routine that we live in. It’s so true that we get stuck in routines that make us feel sometimes like drones. We wake up, do the same things with little changes here and there and it’s ongoing. Along the way, I think I lost part of my goals in the routine of parenthood. Now don’t get me wrong, I wouldn’t trade working from home to be with my babies for the world! But I know in 5 years when K goes to school I will want to find more meaning in my life to feel like an adult again. I guess in reality, being a parent is one of the most adult things a person can do. But, I want to help people and make a difference in this world. I need a career outside of my domain. So, as I lay there nursing, thinking about all of the possibilities of things I could accomplish in this short life I decided I want to go back to school so I can become a lactation consultant. I need a break from the routine of my life encompassing my kids and what a great way to help people! Sure, I’m creating a new routine. But one that will make me feel alive again. More whole and on my own. Funny how a book about an execution would lead me to here. Guess that’s what happens when you break routine! 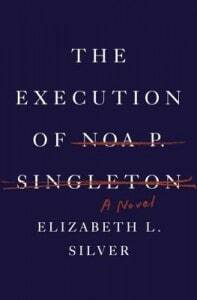 This post was inspired by the novel The Execution of Noa P. Singleton by Elizabeth L. Silver. Mere months before Noa’s execution, her victim’s mother changed her mind Noa’s sentence and vows to help stay the execution. Join From Left to Write on July 30 as we discuss The Execution of Noa P. Singleton. As a member, I received a copy of the book for review purposes.